It took a while for me to write a new blog post (six months! ), but I think it was worth it since I’ve been reading a lot about new technologies applied to biomedicine. Today my post will focus in Artificial Intelligence (AI) and how it could change biomedicine (and several other sectors) as we know today. Everything started back in the 50s, the fathers of the field Minsky and McCarthy, described AI as any task performed by a program or a machine that, if a human carried out the same activity, we would say the human had to apply intelligence to accomplish the task. That obviously is a broad definition, which is why you will sometimes see arguments over whether something is truly AI or not. AI systems will typically demonstrate at least some of the following behaviors associated with human intelligence: planning, learning, reasoning, problem solving, knowledge representation, perception, motion, and manipulation and, also, social intelligence and creativity. Well, tech giants such as Apple, Google, Amazon, Microsoft and others use AI daily to deal with the deluge of data they are acquiring every day. However, the biotechnology and pharma sectors are way behind in using these technologies. This scenario has changed in the last five years or so since pharma companies started looking in to what they call Real World Data (RWD) which is collecting patient data (in a clinical trial, for example) in real time. The way I personally see AI changing the biomedical sector is in five ways that I will describe here. First, I believe Real Time and Real World Data will be crucial to Clinical Trials and this will need a lot of AI technology. Imagine if pharma companies could enroll and collect real-time data on the patients of their trials. 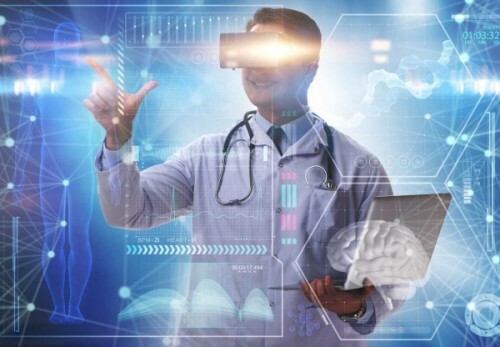 In addition, imagine a “situation room” in which the data points could be seen and accessed for each patient in a trial in real-time and the system could be improved by the AI Technologies (Machine Learning, for example). Novartis is already doing this and their new CEO think pharma companies have to become data companies. I totally agree with his statement. Second, we already know that clinical trials are hard on patients suffering from incurable diseases, mainly because the placebo group (they do not know which group is receiving the drug) will probably die or have more suffering. RWD can identify, using AI technology, small groups of patients that are responsive in the treatment group in clinical trials considered as a “failure” by the FDA standards. In addition, depending on the trial, if the treatment groups are having amazing responses, AI systems can be fast in detecting it. So, the trial can be stopped and both placebo and treatment groups will receive the drug that could save their lives. Third, speech recognition and Machine Learning (ML) are becoming usual in our daily lives. In this case, I imagine a future in which patients in trials could “talk” to Alexa from Amazon or other similar devices (such as Apple, Google and Facebook devices) and say how they feel daily (signs and symptoms, specific issues, etc). Data points collected from each patient daily will speed a lot the trials and drug approval will be faster. Fourth, AI is already being used by academic centers and several “start ups” in the biomedical field to do “in silico” drug design using several complex data generated from patients. Big data, in this case, will be able to test millions of complex interactions in seconds to evaluate drug efficacy and for new drug development. This will increase exponentially success in developing or finding drugs for specific complex diseases. Last, but not least, the fifth example is how the academic sector will be impacted. Several groups have already used AI to basically get the data generated in a scientific laboratory and write the scientific article. This is already a reality, meaning that the Ph.D. students and Post Docs will generate the data and input in an AI system to write the article(s) for them in a faster and more accurate way. This could also be applied to write patents. Image a future in which the academic sector is mostly “technical” and the “intellectual” part will be done by a computer using AI scanning all articles in a specific field to write a paper (or a patent…). This is already happening! Even though it is amazing what AI can do and how it could impact biomedicine, the main concern will be the privacy of the data from patients and samples used in trials and studies. Thus, solutions to better encrypt data will be necessary. Patient data privacy is an issue and it should be taken care carefully. The future of biomedicine using AI solutions looks very bright and full of challenges. I am glad to be helping shape this future using AI and several other technologies. That is a dream come true! You are currently browsing the Genomic Enterprise Blog blog archives for November, 2018.